pre-existing dimer agonist-induced higher order oligomer mediated phosphorylation of various cytosolic substrates (11). Although there is a wealth of knowledge regarding the formation and functional significance of oligomerization in these other receptor families, progress is still being made to determine the cellular implications of the relatively novel concept of GPCR oligomerization. A key step in dissecting the functional consequences of GPCR oligomerization involves understanding how receptors are formed in the cell. The current understanding of the folding and maturation process of a GPCR (or any other a-helical transmembrane protein) assumes an initial monomeric configuration. The formation of a membrane-spanning receptor begins in the endoplasmic reticulum (ER) and occurs in two stages. The first stage involves the sequential pair-wise insertion of transmembrane a-helices into the ER membrane. Several landmark studies on single transmembrane fragments of the seven-transmembrane-domain protein opsin were among the first to demonstrate that translocation of the nascent transmembrane domains through the membrane requires signal sequences and stop-transfer sequences (12-16). The maturation of polytopic integral membrane proteins such as GPCRs begins with the insertion of two a-helical peptide segments into the membrane as a hairpin loop (Fig. 1). Translocation of each hairpin loop involves coincident insertion of two transmembrane domains, with intrinsic alternating signal-anchor and stop-transfer sequences. Asparagine-linked (N-linked) glycosylation can occur cotranslationally as the translocation mechanism proceeds. This concept of membrane insertion of integral proteins was first demonstrated in a multitransmembrane repeat mutant of the single-membrane-spanning asialoglycoprotein receptor H (17). Fig. 1. 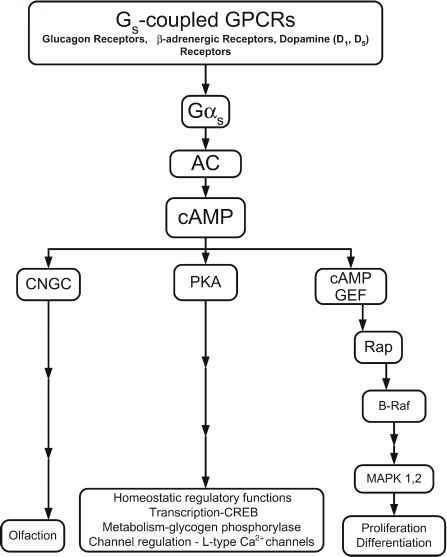 (From opposite page) Maturation process of a GPCR oligomer. GPCR monomers are synthesized in the endoplasmic reticulum (ER) and inserted in the membrane sequentially as transmembrane domain pairs (1). Folding of the polypeptide is mediated by specific ER-resident molecular chaperones, which may also function to mediate dimeric assembly (2,3). Higher order oligomeric assembly may occur with other dimers in the ER (4A) and these complexes will then be trafficked to the cell surface as constitutively formed GPCR oligomers (5A). 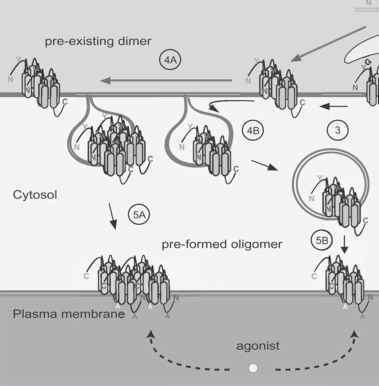 Alternatively, ER-formed dimers may traffic to the plasma membrane (4B, 5B) and form higher order oligomeric units upon agonist induction. ments that contained multiple transmembrane domains. These fragments were demonstrated to insert separately into lipid vesicles, and subsequent assembly between complementary domains was found to result in reconstitution of the native receptor (19,20). This principle has been shown with other GPCRs, including rhodopsin (21,22) and muscarinic receptors (23). To date, there is little information regarding the mechanism by which GPCR oligomers are actually synthesized and which factors are involved in oligomer trafficking through the secretory pathway. However, there are clues from other receptor families and emerging evidence from many rigorous studies on GPCR oligomerization to suggest exactly where and how GPCR oligomers are made and processed.